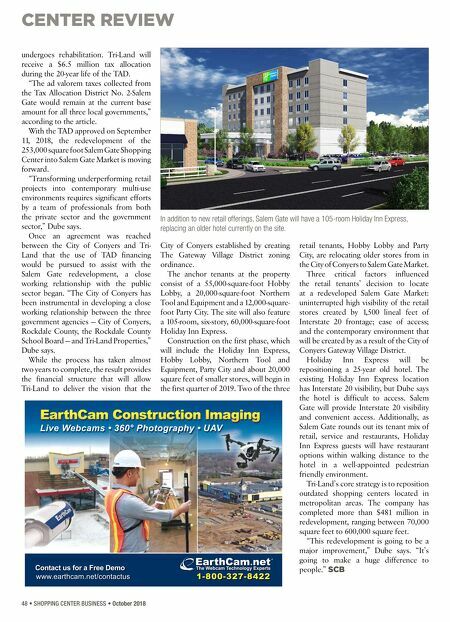 CENTER REVIEW 48 • SHOPPING CENTER BUSINESS • October 2018 undergoes rehabilitation. Tri-Land will receive a $6.5 million tax allocation during the 20-year life of the TAD. "The ad valorem taxes collected from the Tax Allocation District No. 2-Salem Gate would remain at the current base amount for all three local governments," according to the article. With the TAD approved on September 11, 2018, the redevelopment of the 253,000 square foot Salem Gate Shopping Center into Salem Gate Market is moving forward. "Transforming underperforming retail projects into contemporary multi-use environments requires significant efforts by a team of professionals from both the private sector and the government sector," Dube says. Once an agreement was reached between the City of Conyers and Tri- Land that the use of TAD financing would be pursued to assist with the Salem Gate redevelopment, a close working relationship with the public sector began. "The City of Conyers has been instrumental in developing a close working relationship between the three government agencies — City of Conyers, Rockdale County, the Rockdale County School Board — and Tri-Land Properties," Dube says. While the process has taken almost two years to complete, the result provides the financial structure that will allow Tri-Land to deliver the vision that the City of Conyers established by creating The Gateway Village District zoning ordinance. The anchor tenants at the property consist of a 55,000-square-foot Hobby Lobby, a 20,000-square-foot Northern Tool and Equipment and a 12,000-square- foot Party City. The site will also feature a 105-room, six-story, 60,000-square-foot Holiday Inn Express. Construction on the first phase, which will include the Holiday Inn Express, Hobby Lobby, Northern Tool and Equipment, Party City and about 20,000 square feet of smaller stores, will begin in the first quarter of 2019. Two of the three retail tenants, Hobby Lobby and Party City, are relocating older stores from in the City of Conyers to Salem Gate Market. Three critical factors influenced the retail tenants' decision to locate at a redeveloped Salem Gate Market: uninterrupted high visibility of the retail stores created by 1,500 lineal feet of Interstate 20 frontage; ease of access; and the contemporary environment that will be created by as a result of the City of Conyers Gateway Village District. Holiday Inn Express will be repositioning a 25-year old hotel. The existing Holiday Inn Express location has Interstate 20 visibility, but Dube says the hotel is difficult to access. Salem Gate will provide Interstate 20 visibility and convenient access. Additionally, as Salem Gate rounds out its tenant mix of retail, service and restaurants, Holiday Inn Express guests will have restaurant options within walking distance to the hotel in a well-appointed pedestrian friendly environment. 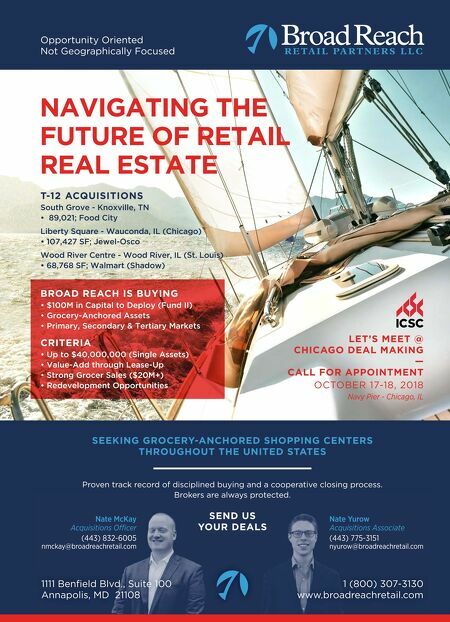 Tri-Land's core strategy is to reposition outdated shopping centers located in metropolitan areas. The company has completed more than $481 million in redevelopment, ranging between 70,000 square feet to 600,000 square feet. "This redevelopment is going to be a major improvement," Dube says. "It's going to make a huge difference to people." SCB In addition to new retail offerings, Salem Gate will have a 105-room Holiday Inn Express, replacing an older hotel currently on the site.